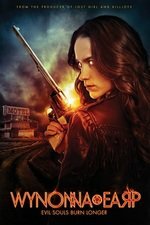 A demon causes havoc in town as Wynonna, Waverly, and Jolene must decide who they can trust. I'm not sure how I feel about this episode. On the one hand, a lot of secrets got revealed and the table cleared for the final fight with Bulshar, whoch is good. On the other hand, I felt that Jolene's harassment went on too long, at the expense of having more scenes about how Michelle and Wynonna put the pieces together. This might just be me - on every show I watch, I hate "bully" episodes, which is where the bad guy just beats on the good guys for long, drawn-out, humilations. It's why I couldn't handle Negan. So it's certainly possible that this is just Jolene punching my "bully" buttons. I like Zoie Palmer's work a lot from Lost Girl and Dark Matter, and she did an amazing job with the demon's motivations. Oh! The closing credits listed actors for a "Young Julian" and a "Young Michelle". Did I blink and miss that scene? I think the Young Julian and Young Michelle scene might have been cut? Which is a real shame, considering Bobo's revelation at the end I would really like to see what Julian looks like. Speaking of Bobo, I was so happy to have him pop up in the episode I actually clapped my hands in glee. I've rewatched it and I'm coming around to liking it some more. I'd still like to have seen more of that moment where Mama and Wynona realized that the baked goods were the key, but what the heck. Also I would have liked to see young Julian. I listened to some podcasts and I guess on some levels Jolene was written to represent depression and mental illness, which is interesting. I'll need to rewatch with that in mind. I'm glad the Joleneness of it all was limited to one episode, and we got some answers and got to see Bobo again, which is good. I loved seeing how Doc's entire body language changed, in particular, each time he got does with baked goods. Overall, though, not enough Wynonna for me personally. Squeak Attack can you point me in the direction of those podcasts? odd ghost, there's this interview with the writer of the episode, Shelley Scarrow, and episode 110 of the Tales of the Black Badge podcast. Oh! Yes, does that help me understand the episode a lot more. I know she's not literally a mental illness, but they do seem to be doing that Buffy thing where they reify something horrible in a teenager's life as a literal monster and then the team defeats it in ways that are (metaphorically) the same way a real teen would overcome the real thing. Although with more violence, because Buffy. And now because Wynonna. Oh, now, there's a cross-over. I just wanted to add: thanks to everyone who helped me understand this episode. It's gone from being my least favorite Wynonna ep to one that's somewhere in the upper middle. I'm really liking Valerie Anne's recaps for WE on Autostraddle, especially the recap for this episode which delves into the depression metaphor.